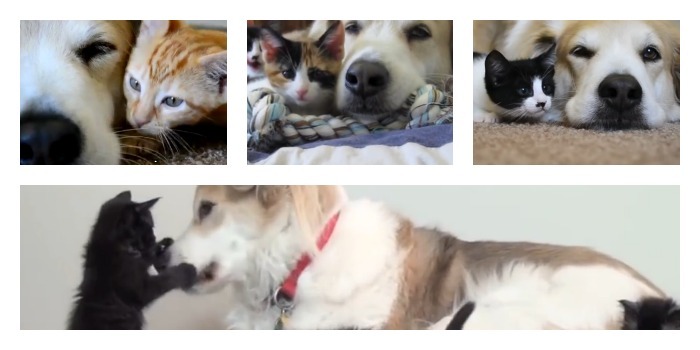 Murkin the dog, perhaps the most patient canine caught on video, loves his foster kittens. These adorable kittens are mothered by Murkin the dog (who is a male) while they get healthy and get ready for adoption. You might want to take out an onion and put it nearby, just in case anyone sees you watching these and asks about all the tissues. It's sleepy time, but you're not going to get much sleep when the kittens are active. This doggy let's these kittens walk all over him. What a sweet dog! 3) Cat Got Your Tongue? This kitten tries to steal Murkin's tongue! Twice! Murkin doesn't seem worried. 4) Watch Out for the Kittens! Oh noes! The kittens have taken over the bed, and Murkin is afraid to lie down on the fragile creatures. What a gentle doggy! Abandoned kittens need comfort, and who is there for them? You guessed it! Murkin wants to play, but the kittens aren't quite sure what to make of this giant creature. As Toni Braxton sang it, this doggy's heart is unbroken as he finally gets some attention from a kitten. Thomas O'Malley Flufferpants and Murkin snuggle and play one last time before this kitty gets a new home. Flufferpants was in pain when he first showed up, and he and Murkin became fast friends. It's the most gentle dog in the universe versus crazy kittens! Don't bite my nose! This adorable little calico is giving our dog buddy a run for his money. According to his human, dcjanelle, Murkin is a shelter dog adopted at about 6 months. Born in 2003, he's thought to be a great pyrenees/lab/golden retriever/australian shepherd mix. Murkin's human fosters kittens for a local animal shelter, helps them recover from a previously rough life, and finds them homes. This has given Murkin the chance to meet many kitties and there's plenty of video footage to prove it. Clearly, this is one kitty loving dog! Both Murkin and his human are heroes, and we owe them a big thank you for caring for all of these kitties. If you know anyone who would like to improve their day, send them to this page so they can enjoy these videos as well. Now, what did I do with that onion?